Shanghai Optics is a custom optics manufacturer with over 55 years of optics manufacturing experience. We produce high precision Metalized Mirrors according to customers’ specifications. Aluminum has a high reflectance over the entire visible and near infrared spectrum. It is simple to deposit as a thin film, making it the ideal choice for most non-critical applications. The aluminum is over coated with a single layer of MgF2 to make it considerably more durable than bare aluminum. There are three degrees of flatness: l/4, l/10 and l/20. 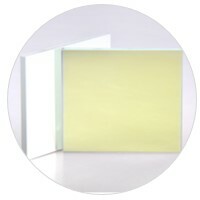 The l/4 and l/10 mirrors are deposited on BK7 substrates but the l/20 mirrors use synthetic quartz resulting in significantly better thermal stability. A broad selection of sizes is offered as standard. Other sizes can be supplied on request. Mirrors up to 1 inch in diameter have a ground rear surface but all other mirrors are polished on the rear face.